Three days after the historical Paul Henderson goal in 1972 that secured a Canadian victory in the Summit Series, history was made at Jarry Park in Montreal.On October 2, 1972, Bill Stoneman pitched the first no-hitter on International soil defeating the New York Mets 7-0. I spoke with Bill about that fateful day almost 40 years later. “You know this is the first time I’ve ever connected the dates between my no-hitter with the Paul Henderson goal,”Stoneman commented. No question I remember the ’72 Series, we talked about in the Expos clubhouse and I remember the Eighth game was not played at it’s typical time (afternoon EST). I know Ken Singleton was a fan as well. This was Stoneman’s second career no-hitter after beating Philadelphia Phillies 7-0 at Connie Mack Stadium.His first no-hitter occurred during his fifth career start and it was only the ninth game of the Expos existence. Stoneman had an eight year career with Chicago, Montreal and the California Angels. He was the general manager of the Angels for eight seasons and now serves as a senior consultant. “During the second no-hitter, I can recall the fans at Jarry Park getting louder and louder as the game went on. Generally, you block those things out of your mind when you’re pitching, but I certainly recall that.” Stoneman shared. “During my time in Montreal, 10-12 of us would spend the winters in Montreal. When I think about the ’72 Summit Series, I know we were excited about the outcome even though none of us were Canadians, Stoneman commented. Hear the interview on the link below. Recorded on April 2nd “Hockey This Morning” @NHLHomeIce with Mike Ross and Mick Kern. The Cops for Cancer program started in 1994 when a Sergeant with the Edmonton Police Service organized a group of officers to shave their heads to support a 5 year old boy suffering from cancer. Since then the Canadian Cancer Society and police services across the country have teamed up to raise money and awareness for this worthy cause. The Cops for Cancer event in Peel started in 2004. To date we have raised $760 000 dollars, all of which goes directly to the Canadian Cancer Society. The actual event involves officers, civilians, paramedics and anyone else who wants to, raising money to shave their head.The past 8 years have seen more than 1500 officers get their head shaved, including more than 80 women!!! This year’s goal is to surpass the million dollar mark for the event since it began in 2004. To do this will require us to double the amount the event has generated in previous years. That is why we need your help! In addition to the actual event, there are numerous sub-events where money is raised to achieve our goal of fundraising and awareness; corporate head shaves, bake sales, golf/hockey tournaments, teacher vs. police games and many other inventive ideas. This allows for everyone to participate in the Cops for Cancer Campaign as well as the ultimate goal of Making Cancer History! Buy a t-shirt – Celebrate the 40th anniversary of Paul Henderson’s Goal of the Century with this commemorative shirt. $7.99 from each shirt goes to the Canadian Cancer Society and it makes a great gift. We’ve all done it! It’s the last period, the last quarter, the last inning and you feel there’s no way your team is coming back. You head to the exits, you turn the channel, you’ve had enough as you’re disappointed that your team is about to lose. When I talk to people about the ’72 Summit Series, a lot of different memories and emotions have been shared. Last week, I heard a story about how a father had taken off work and his son had come home from University to share that final historic game together at home. With Team Canada trailing 5-3 to begin the 3rd, the disappointed and maybe even frustrated father, decided to head back to work, because he felt Canada had lost the final game and Series. “My Dad turned on the radio as he drove back to work and listened as Team Canada came back to tie the game and with less than a minute remaining in the game. Henderson scored! While I celebrated at home, my Dad cried as he listened to it on the radio,” he commented. We’ve all done it. We’ve all walked away from a game. I’m just curious how many people missed the Paul Henderson goal?! The ’72 Project is pleased to announce Sports Writer Jim Prime will be a periodical contributor to ’72 Project blog posts. 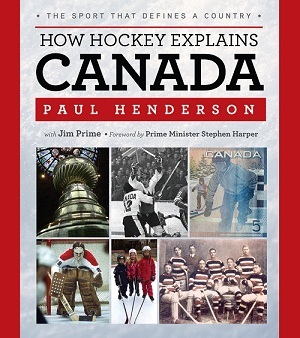 Prime recently co-authored with Paul Henderson, “How Hockey Explains Canada”. 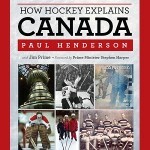 Henderson and Prime offer intelligent discourse on Canada’s national sport that goes far beyond the sport’s most-loved icons, great plays and notorious brawls and looks into the history and culture of the game to explain why hockey has had such an enigmatic hold on Canadians. Prime has written more than a dozen sports-related books and has contributed articles to various periodicals. He has coauthored books with the immortal Ted Williams and the immoderate Bill “Spaceman” Lee. He grew up a rabid Montreal Canadiens fan on Long Island at the southwestern tip of Nova Scotia. Jim is co-founder of the Bluenose Bosox Brotherhood and acting Lieutenant-Governor for Nova Scotia of Red Sox Nation. He lives with his wife, Glenna, in New Minas, Nova Scotia. For baby boomers, Paul Henderson’s goal against the USSR was a moment in history. Sean Mitton a Canadian living in the US is connecting with other expats and collecting memories of that historic goal. The interview was conducted by Mark Harvey of CBC Radio Edmonton. Harvey shares his own ’72 story at the end of the interview. 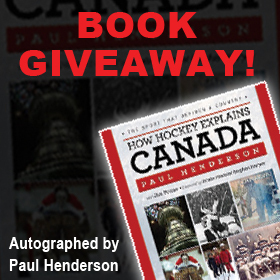 Paul Henderson Autographed Book Giveaway!! All you have to do to enter is sign up for the ’72 Project Newsletter. A random draw with 2 winners to be announced Dec. 15th, 2011. Congratulations to book winners Cory Lavalette & Kim Macies! What is it about Canada and Canadians that inspires such unbridled passion for this simple game of ice, puck, and stick? In How Hockey Explains Canada, authors Paul Henderson—scorer of Canada’s “Greatest Goal”—and Jim Prime explore these and many other questions by delving into the hearts and minds of hockey-loving Canadians from coast to coast to coast. Canadiens fans might be shocked to learn that the much-despised Toronto Maple Leafs actually saved the Montreal franchise from bankruptcy during the Great Depression. Others might be surprised to discover Rocket Richard’s key role in kick-starting Quebec’s Quiet Revolution. From the first Tim Hortons coffee in the morning to the final late-night television sports wrap-up, Canadians are immersed in hockey. Through interviews with more than 35 current and former NHL players, coaches, executives, and broadcasters—including a dozen Hall of Famers—How Hockey Explains Canada examines why hockey has such a hold on this country and how our national obsession explains us as a people. PAUL HENDERSON is one of Canada’s most beloved sports heroes. Best known for scoring the winning goal for Team Canada against the Soviets in Game 8 of the 1972 Summit Series, he has become as much respected for the way he handled the instant fame as for the goal itself. JIM PRIME has written more than a dozen sports-related books and has contributed articles to various periodicals. He has coauthored books with the immortal Ted Williams and the immoderate Bill “Spaceman” Lee. He grew up a rabid Montreal Canadiens fan on Long Island at the southwestern tip of Nova Scotia. Jim is cofounder of the Bluenose Bosox Brotherhood and acting Lieutenant-Governor for Nova Scotia of Red Sox Nation.